The first fort built by D'Iberville at the original French settlement of Biloxi, was named to honor the French Minister of the Marine (Navy) and was located on a bluff overlooking the gulf. The Fort Maurepas settlement was named Biloxi for the local Indian tribe which lived on the Pascagoula River. In 1981, a replica of Fort Maurepas was constructed on its original site at the Biloxi settlement in what is now Ocean Springs. The 1699 Historical Society holds an annual re-enactment of D'Iberville's 1699 landing with his crew at the site of the fort. The annual event with area re-enactors portraying D'Iberville and his crew in period dress is a very popular and well attended event on the Mississippi Coast. Established in January of 1699 on the east side of Biloxi Bay in what is now the city of Ocean Springs by Paul Pierre LeMoyne, Sieur D'Iberville. The fort which had been completed on May 1, 1699 was built as a four sided fort with pointed bastions at each corner mounting 12 guns. A moat/ditch and external redans provided additional protection for the fort. Jean Baptiste Saucier, who arrived here with D'Iberville on the ship La Badine in 1699, lived in the Biloxi settlement from early April until May 1699, when he sailed on the La Badine on D'Iberville's return trip to France. Sieur D'Iberville left a garrison of seventy-six men and ten officers at Fort Maurepas. On January 8, 1700 Jean Baptiste Saucier returned with D'Iberville to Fort Maurepas and the Biloxi settlement from Rochefort, France onboard the Renomme. It was from Fort Maurepas that Jean Baptiste Saucier led groups of soldiers to explore the area from the Biloxi fort to current areas of Bay St. Louis, and Delisle, Mississippi. The soldiers of the fort would live with the Indians of the area while waiting for ships with renewed food supplies from France to arrive. The French ships returning with supplies would anchor at Ship Island and any supplies, passengers or soldiers from the ship would be put aboard a smaller boat that could navigate the shallow Mississippi Sound and transported the twelve miles to the coast to finally arrive at the settlement and fort at Biloxi. This journey which today takes around an hour to complete, would have taken hours during that era with sails or rowers. The fort at Biloxi was abandoned in early 1802 and the garrison moved to Dauphin Island near Mobile to construct a warehouse. By late March of 1702, D'Iberville had laid out the streets of Mobile and the garrison moved to the new Fort Louis constructed near the river at Mobile. Our ancestor, Jean Baptiste Saucier, was granted a large plot of land in old Mobile where he settled, married and lived the remainder of his life. 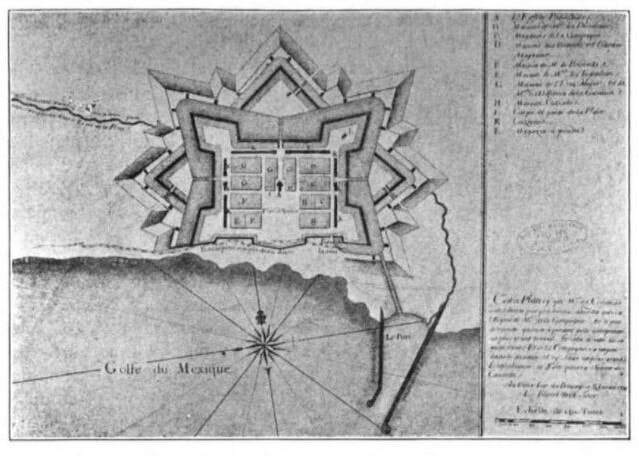 The Fort was again used from 1719 until 1722 during the period that the French government was moving the colonial capital from Mobile to New Orleans, and were waiting for the new government buildings to be completed at New Orleans. For these few years, 1719 to 1722, Fort Maurepas and Biloxi were actually considered the capital of the Louisiana Colony until it was moved to New Orleans in 1822. The fort eventually burned and was not rebuilt, although some settlers did remain at Biloxi. The replica of Fort Maurepas, which opened on July 21, 1981, was destroyed by Hurricane Katrina when it devastated the Mississippi Gulf Coast on August 29, 2005. 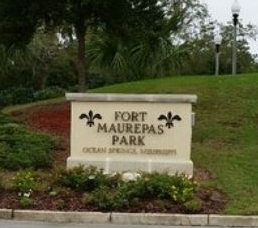 In August of 2006 ground was broken for a new park to be constructed on the original site of Fort Maurepas. 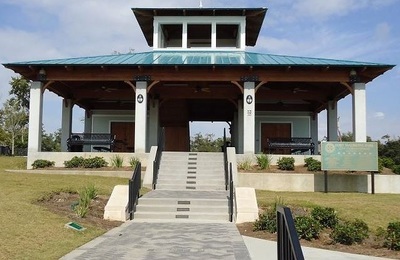 The new "Fort Maurepas Park" was finally completed and opened to the public on October 10, 2010. The beautifully landscaped park includes a playground, splash pad, stage and a two story pavilion structure to view the beach and area surrounding the park. A bronze statue of Pierre Le Moyne, Sieur D'Iberville is located near the two story pavilion building. The new park, a memorial to Fort Maurepas and Pierre Le Moyne, does not include a replica of the original fort. 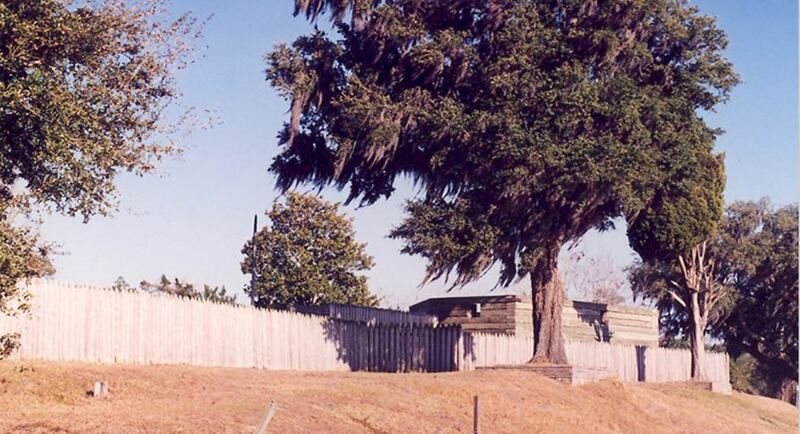 Hopefully sometime in the future the City of Ocean Springs and the Historical Society will undertake the construction of a new replica of Fort Maurepas on the site as a remembrance of the fort's construction and life in the early Louisiana Colony. Pictured below is the replica of Fort Maurepas constructed and opened in 1981. Picture of Fort Maurepas taken in 1995 by Ray L. Bellande. It was destroyed in August 2005 by Hurricane Katrina. Pictured below is the new Fort Maurepas Park and Pavilion opened in 2010. Photos from the City of Ocean Springs Archives.